Tony Podesta | Darth Frank, "The Tank"
Konstantin Kilimnik’s first name has now been corrected in this post. Conservative outlet Daily Wire noticed lobbyist extraordinaire Tony Podesta (above) had been subpoenaed in August by the “Russia Ruins U.S. Elections 2016” investigative committee head Robert Mueller (below). This is only interesting because Hillary’s decrepit former campaign chairman John Podesta, now a partisan writer for Washington Post, had to cease and desist his unauthorized lobbying for Vladimir Putin before signing onto Hillary‘s RMS Titanic campaign for U.S. president in 2016. Apparently, ex-Trump campaign chair Paul Manafort and the Podesta Group both worked with the pro-Putin outfit European Centre for a Modern Ukraine. Tony Podesta pocketed over $1 million to lobby the American Feds, casting former Ukrainian President Viktor Yanukovych as a decent guy–without authorization from Washington to lobby on behalf of a foreign agent. Daily Wire reports Podesta registered these activities only after NBC blew the whistle. 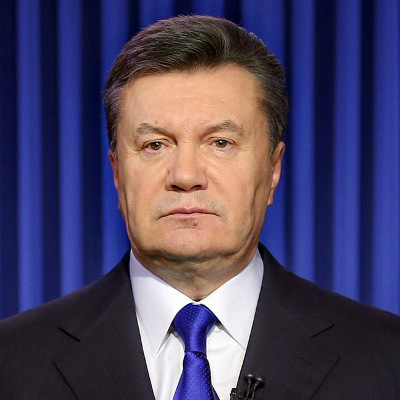 Yanukovych (below) was exiled to Russia in 2014 after reportedly using his office to help the Kremlin undermine Ukraine. Mueller started investigating Podesta’s possible violation of the Foreign Agents Registration Act in October. Podesta put out a statement that his company always complies with lobbying restrictions, then resigned on October 30. However, Politico reports this transition was underway months ago. Like about the same time Tony Podesta got subpoenaed. Mueller’s office and the Justice Department together have spent over $6 million on the investigation through September 30. The juiciest results of the probe thus far include Trump’s (oh so briefly) national security adviser Michael Flynn’s cooperation after admitting to lying to the FBI and Manafort’s indictment on twelve charges including conspiracy against the United States, money laundering, failure to register as a foreign agent and multiple failures to file reports of foreign bank and financial accounts. Another Trump adviser, Rick Gates, was indicted and house-arrested alongside Manafort (also) on October 30. The “colleague,” with whom Manafort communed during the 2016 campaign, is Konstantin Kilimnik. The pair’s piece was to run under the name of Oleg Voloshin. A massive leak of shady financial dealings by the world’s elite, dubbed the “Panama Papers,” is currently grabbing headlines in every industrialized nation except America. This is because the American media’s favored 2016 presidential candidate, former Secretary of State Hillary Clinton, associates daily with representatives of one of the most corrupt national front banks named in the Papers (her questionable “charity,” the Clinton Foundation, notwithstanding). The Kremlin’s unofficial state central bank, Sberbank (“Savings Bank in Russia”) is Russia’s largest financial institution. Founded in the 19th century, the banking conglomerate controls 30% of Russia’s banking wealth and employs 250,000 people. Many senior employees are former Russian intelligence, though observer.com, who highlighted this story to DarthFranktheTank.com, points out the “former” is just on paper. The bank functions as Vladimir Putin’s personal money laundromat, brazenly funding Russian intelligence ops. Ukraine accused Sberbank in 2014 of directly funding terrorism, and observer.com suggests this is a fairly accurate summation. Western intelligence supports the claim that the nominally private Sberbank is for all purposes a covert funding arm of the Kremlin, including activities of the Russian Foreign Intelligence Service (SVR) in over 20 countries. Bombings of two Sberbank branches in Kyiv, Ukraine last year caused (glaringly) no casualties but garnered ample media attention: thinly-disguised Russian propaganda to demonstrate “Ukrainian aggression” following Putin’s not-quite-bloodless annexation of Crimea. Why should a corrupt international bank that essentially operates as Russia’s CIA concern America? Sberbank hired the Podesta Group as lobbyists to improve its public image shortly after the Panama Papers leak. Who heads up the Podesta Group? Tony Podesta and his brother John, campaign chair for Hillary 2016. The Observer opinion notes the Podestas took the job in poor faith, as their services are only legal in the U.S. if Sberbank is a private financial institution. Since Sberbank is obviously state-owned, this deliberate oversight avoids the inconvenience of the Podesta brothers complying with the Foreign Agent Registration Act and registering with Washington as agents of the Russian government. John and Tony Podesta aren’t fooling anyone with this ruse. They are lobbyists for Vladimir Putin’s personal bank of choice, an arm of his Kremlin and its intelligence services. Since the brothers Podesta are presumably destined for very high-level White House jobs next January if the Democrats triumph in November at the polls, their relationship with Sberbank is something they—and Hillary Clinton—need to explain to the public. We can look forward to more fawning articles about Hillary’s Chipotle order, or even a little ribbing on her defective Metro card. But don’t expect the American media to mention the Panama Papers if they can help it. CORRECTION: An earlier version of this story referred imprecisely to the fouding [sic]of The Podesta Group and to the Podesta brother who registered the firm they founded as a lobbyist for Sberbank. The Observer regrets the errors.